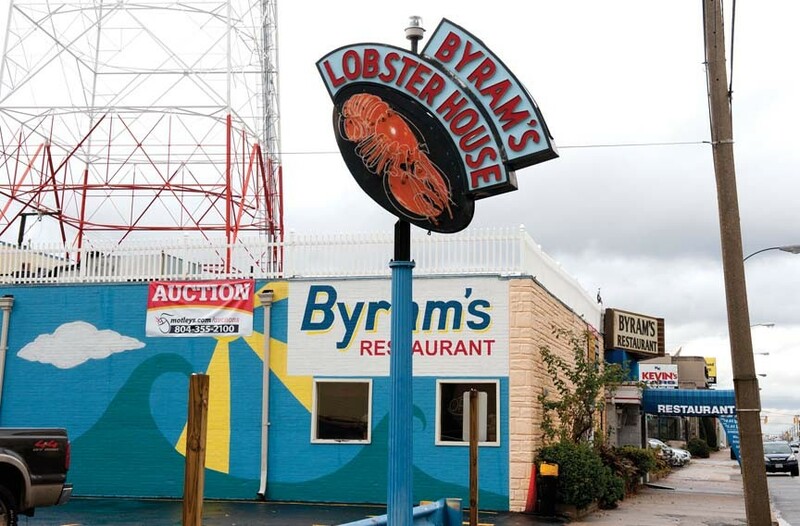 Byram’s Lobster Sign Is Safe in Chester | News and Features | Style Weekly - Richmond, VA local news, arts, and events. The famous Byram’s sign, long seen on Broad Street, now is in storage in Chester. Twenty miles is quite a hike for a lobster, especially a neon one. 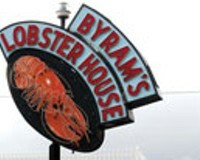 The famed Byram's Lobster House sign went missing after a change in ownership, Style reported last week. But it's turned up safe and sound at Holiday Signs in Chester. The glowing crustacean lit up Broad Street for more than 60 years before it was removed in February. "I'm keeping it for Gus [Nikiforos, former owner of Byram's] until he figures out what to do with it," says Henry Moore, founder and project manager of Holiday Signs. "He wants to put it back up." Jeff and Corina Kelso purchased Byram's last year, but were unsuccessful in their attempt to breathe new life into the seafood institution. The Kelsos closed Byram's earlier this year and opened a short-lived restaurant in the same space called Tower Fish House. The sign was removed in the transition. After the Valentine Richmond History Center declined to add the sign to its collection, Jeff Kelso told another media outlet that plans were in the works to donate the sign to a nonprofit. Until Nikiforos is ready to reinstall the 9-by-10-foot sign, Moore is storing it at no cost in an outdoor rack. He estimates that fully refurbishing and reinstalling the sign will cost $10,000 to $12,000, though it could be remounted as-is. The sign is capable of animation, Moore says, lighting up sections of the lobster in sequence. "It's a landmark of Broad Street," Moore says. "It's an inspiring design from the past that's still up-to-date today."